Islamism in Egypt is more diversified in terms of its sociology and ideology than is usually assumed. Through linguistic analysis of Islamist rhetoric, this book sheds light upon attitudes towards other Muslims, religious authority and secular society. Examining the rhetoric of three central Islamist figures in Egypt today - Yusuf al-Qaradawi, Amr Khalid and Muhammad Imara - the author investigates the connection between Islamist rhetoric and the social and political structures of the Islamic field in Egypt. Highlighting the diversity of Islamist rhetoric, the author argues that differences of form disclose sociological and ideological tensions. Grounded in Systemic Functional Grammar, the book explores three linguistic areas in detail: pronoun use, mood choices and configurations of processes and participants. The author explores how the writers relate to their readers and how they construe concepts that are central in the current Islamic revival, such as ‘Islamic thought’, ‘Muslims’, and ‘the West’. 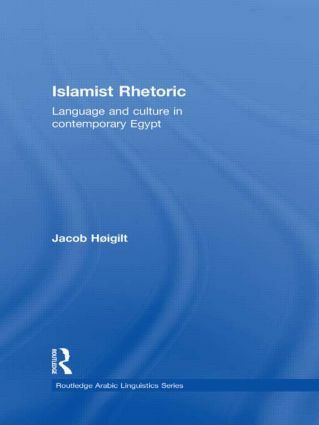 Introducing an alternative divide in Egyptian public debate - between text cultures rather than ideologies - this book approaches the topic of Islamism from a unique analytical perspective, offering an important addition to the existing literature in the areas of Middle Eastern society and politics, Arabic language and religious studies. Jacob Høigilt is a Middle East researcher at Fafo Institute for Applied International Studies in Oslo, Norway. His main research interests include Islamism, Arabic sociolinguistics and politics in the Arab world.